Injuries such as sprains, dislocations, contusions, effusions of blood and effusions into a joint, fractures; post-operative and post- traumatic oedema and swelling of the soft tissues. Inflammatory processes and degenerative processes associated with inflammation on the various organs and tissues, including, in particular, on the support and mobility apparatus (tendovaginitis, styloiditis, epicondylitis, bursitis, scapulohumeral periarthritis, ect. ); arthrosis of the hip, knee and small joints; commotio cerebri acuta. Also recommended for: swelling, bruising of soft tissues & muscles. Local injuries, including sprains, strains, swollen joints and inflamed areas. Tender areas, mosquito bites, ear infections, skin irritations, herpes blisters, inflammatory issues and much more. (composite) family. Injection solution, drops: As a matter of principle, Echinacea should not be used in progressive, systemic diseases such as tuberculosis, leukemia or leukemia-like diseases, inflammatory diseases of the connective tissue (collagen disease), autoimmune diseases or other chronic viral diseases. 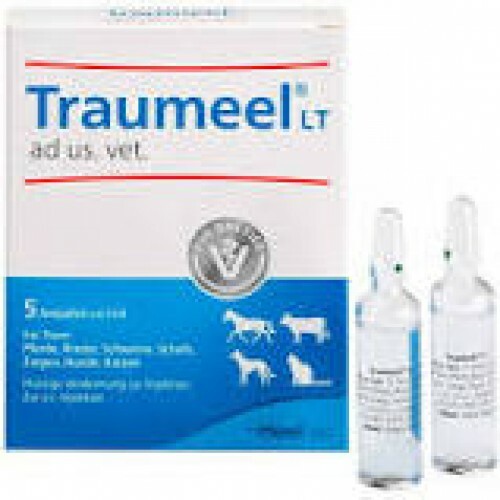 Traumeel ad us. vet. is to be administered by s.c., i.m., i.v. or periarticular injection, and can also be administered orally.